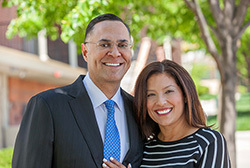 The Salazar family has been a UNC supporter for several years, establishing a scholarship to support UNC's first-generation students and student-athletes. UNC is a doctoral research university with premier programs in education, health sciences, business and the performing arts. Founded in 1889 as the state teachers' college, UNC has always worked to promote human understanding and enrich lives. With approximately 12,000 students enrolled, UNC focuses on five areas of engaged learning: research and creative work, civic engagement, global experiences, leadership and professional experience. Established in 1999 by Rob and Lola Salazar, the Salazar Family Foundation's mission is to impact the lifelong learning of students through supporting the growth and efforts of organizations committed to improving the quality of education and student's access to it.